I was in the mood for some fish tacos, which was perfect because Cinco de Mayo was just around the corner! This dish, I originally assumed, started it’s life as tex-mex. In actuality it’s originally from Baja-California, Mexico and was originally called Tacos de Pescad, or Codnoscenti. 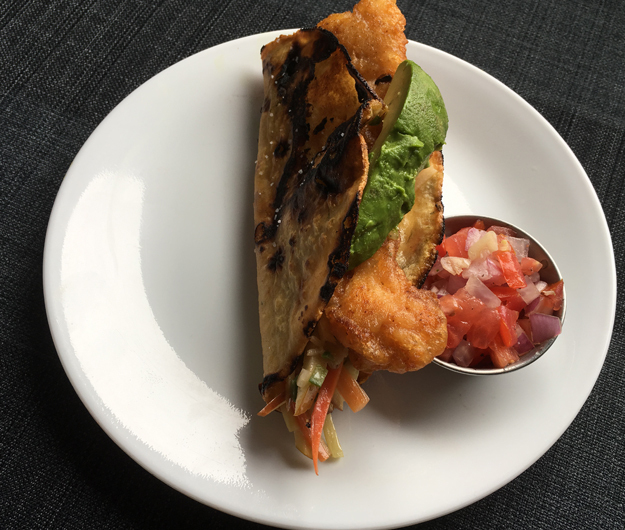 It was basically a traditional taco, with battered fish in place of the pork/beef. From what I can tell, since then it has been given an English name and adopted by pub and resto bar menus across America and Canada. It’s my assumption that it’s northern migration was what lead it to evolve into what we know today here north of the mexican border. There is something about the mix of crispy, savoury, and sweet, with a Mexican twist, that’s just unparalleled. Apple Slaw, Rum Battered Haddock, and Homemade Corn Taco shells were the main things I wanted to experiment with. As stated above, I feel this is known more as pub fair than authentic Mexican cuisine, so I wasn’t too worried about ingredients usaly found in Mexico. However, since there is something wrong with my brain, I also felt that home-making the corn tortilla and the mayo for the slaw was non-negotiable. This is a long recipe, but nothing is overly complicated about it. I urge any new cooks to try making it. Most of it can be made in advance, which means you can make this over a day or two, and not have to try so many new things at once. I don’t know how other food blogs manage to have long stories before they get to their recipes, so let’s get right into the guts of this. In a big mixing bowl add the Massa, 2 pinches salt, and the lime’s zest and juice. While lightly, but continuously, mixing with a spatula, slowly add about 1/3 of the hot water. The mixture should should start to clump together. At this point, you can start working the dough with your hand while you slowly add little bits of water. Once the dough can form a ball that doesn’t crumble you can discard the remaining water. The final dough ball should be soft, and feel a bit moist to the touch. if it feels a dry put it back in the bowl and work in more hot water. a little too moist is better then too dry. Really it should feel like Play-Doh. If you never used play-doh, let your mom know she failed you. This is officially part of the recipe, so you have to do it, or it won’t work. Place ball under a damp towel, or in plastic wrap for twenty minutes. this will give the Masa time to evenly distribute the liquid. this can also be left in the fridge for a day or two covered in plastic. Divide the ball into 4, and roll each section into its own ball. Cover all of them with plastic wrap. If you have a Tortilla press, follow the directions that came with it to make your dough into tortillas, then skip to step 13. I personally don’t believe in buying things I will use twice a year, unless its a matter of safety or necessity. So I don’t own a tortilla press, however I have come up with a way to make perfect tortillas. Lay out a 1.5′ sheet of Parchment, and put your 1 dough ball in the centre. Use a rolling pin to roll the dough ball just until it’s wider than a soup bowl. Make sure to roll back and forth and side to side. FYI: At first your plastic wrap may cling to the dough causing it to curl upward. Simply lift the plastic wrap off the dough, gently place the dough down and put the plastic back. If the parchment becomes wrinkled, simply pull its corners. Gently remove your plastic wrap and place a bowl upside down on your dough, using a butter knife cut around the rim of your bowl, this will give you perfectly shaped tortillas. Use the scrap pieces to fill any cuts, are place the rest to the side. There is no gluten in Masa, so you don’t have to worry about over working it. Slowly peel the tortilla off the parchment, and place on the side till you’re ready to cook them. I place all the tortillas on top of each other with a piece of parchment paper to separate them. Cover with plastic wrap, or damp cloth. Repeat steps 6 – 12 until all the dough balls are gone. Cook each tortilla one at a time on a non greased cast iron pan set to high heat. If you don’t have cast iron, you can use a stainless steel pan, but you will have to wait longer in between cooking each tortilla for the stainless to regain its heat. It should take about 30-40 seconds on the first side, and about 20 seconds on the other side. They may puff up, thats a good thing, it means they are well rolled. Let cool for about 5 minutes, and then place in zip -loc bag until you’re ready to fry them. Heat up a pot with filled with 1/4″ of canola oil. You’re looking to reach around 400 degrees Fahrenheit, or about 200 degrees Celsius. Using tongs, pick up a cooked tortilla, and lower it into the oil so that only half of it is frying. Using the a wooden spoon push down any big bubbles that form. Using the tongs, tun the tortilla 180 degrees, and fold so it’s shaped like a taco shell. Once the shell holds its shape, move to the side and sprinkle with salt. Add Lime Juice, Salt and Pepper a little at a time until you’re happy with the taste. You want this to be slightly on the stronger side, because the other ingredients will slowly release liquid and water down the intensity. Put in fridge to chill, minimum an hour, ideally overnight. Place a damp tea towel in a circle shape on the counter, and place large mixing bowl on top. This will hold the bowl still while you’re working. Add Egg yolk, Dijon mustard and White Wine Vinegar into the large bowl, and whisk until you have a mixture that’s a solid colour. Slowly add Canola Oil into mixture while whisking. The oil should emulsify into the mixture so you have a solid consistent dressing. You don’t want the mixture to break, so you’re better off adding it too slowly, than too fast. When about 3/4 of the oil is added, stop and add salt and pepper to taste. You will season again at the end, but this will better distribute the seasoning, and give you a bench mark of what it should taste like when you do your final seasoning. Once all the oil is added, taste and adjust for final seasoning. Apple Sliced the same way as the Tomato for the Pico de Gallo, into 1/8″ rounds, then cut into sticks. The apple should have a little bit of peel on both ends. Mince Celery as thin as possible. They should be almost transparent. Dice the Yellow Onion and Jalapeño into 1/4″. Make sure to discard the seeds from the Jalapeño. Mix all the ingredients except the dressing into a mixing bowl, then add the dressing desired amount of dressing to the bowl. Place slaw covered in the fridge overnight. This will allow the dressing to break down the toughness, and give the flavours a chance to meld. Finally. The last Mise En Place you will need, the Crispy Fish. Everything else could be done the day before, but this is the best when it done right before eating. Mix together Chili powder, paprika, Cumin, Cayenne, Onion Powde and Garlic Powder into a small bowl. Cut the Haddock into strips, 1/2″ by 3″ and lay out on a cutting board or baking sheet. Cover Haddock strips with spice mixture on all sides evenly and liberally. Set aside until needed. In a small bowl mix together Bread Flour, Corn Starch and Baking Powder. Fill up a pot or frying pan about 1/4″ with canola or peanut oil. If your using a frying pan, make sure you choose one that has sides that are a least double the height of the oil. Put it on a burner at medium heat and let it heat up to 400 degrees Fahrenheit. Whisk in water until batter is the right consistency. You’re looking for a viscosity similar to whipping cream. Lay each piece of seasoned Haddock into the batter, making sure the Haddock is completely covered. Remove the Haddock from the batter and let the extra batter drip off, and place on a wire rack. Place two or three pieces of the batter covered Haddock into the hot oil and let it cook, make sure to turn over when the bottom is golden brown. Once the second side is cooked, remove the fish and place on paper towel covered plate and sprinkle lightly with Salt.